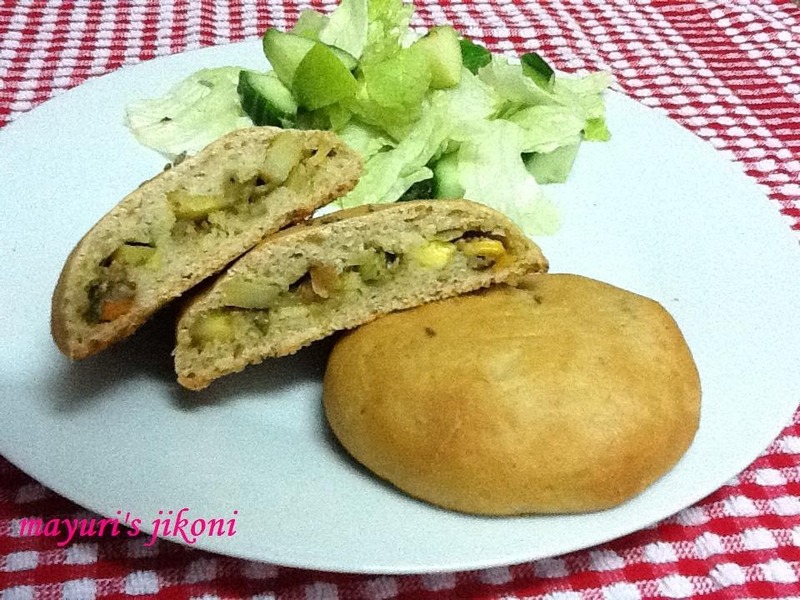 Stuffed bread with a filling of your choice and baked fresh is as good as having an appetizing sandwich. I love baking stuffed buns to go with a plain soup, or to take along when travelling. Haven’t been for a picnic for ages but use to bake them when we would go with the kids to the beach. After a whole day at the beach, kids would be hungry. Stuffed buns was a clever way to get them to have a ‘sandwich’ stuffed with fresh vegetables. I baked some a few days ago for tea time as we had guests over. Something different from the regular dokhras and bhajias to serve the guests. Sieve both the flours and salt together. Add the yeast, cumin seeds and sugar and mix well. Add the warm milk and form a dough. Dust the counter or board with extra flour. Knead the dough with the heel of your palm for nearly 10 minutes till it becomes smooth and silky. Form into a big ball. Rub oil all over it. Grease a big bowl with oil and place the dough in it. Cover with a cling film or plastic sheet and let the dough ferment to double the size in a warm place. This will take about 2 to 3 hours. Boil or steam peas till they are done. When the oil becomes hot, add the mustard and cumin seeds. Add the onion and asafoetida and saute for a few seconds.Add ginger and chilli paste. Stir fry for a few seconds. Add carrots, potatoes and salt. Reduce the heat to a low setting. Cover the pan and cook till the vegetables are done. Add paneer, corn and peas. Mix well and cook for 1 to 2 minutes. Add sugar, lemon juice and coriander powder. Mix well and take the pan off the heat. After the mixture cools down, add fresh coriander,cinnamon and clove powder. Mix well and keep the filling on the side. After the dough has doubled in size, knock it down gently and make a ball again. Let the dough rest for 5 minutes. Divide the dough into 12 parts and roll into balls. Remember to use extra flour or oil if the dough sticks to your hands. Take one part of the dough and pat it into a circle between your palms. Take about 1½ tablespoonful of the filling and place it in the middle of the circle. Gather up the edges and press it to seal. You will be left with a round shaped dough. Place the ball with the sealed size under, on a greased baking tray. Repeat steps 3 to 6 with the remaining dough and filling. Place the balls about an inch or 2 apart as they will ferment and become double the size. Place the tray in a warm placed ( I prefer to place it in the oven) and let the dough rise again till its double the size. This will take about 1 to 1½ hours. Remove the tray from the oven. Preheat the oven to 200°C. Brush milk over the buns gently. Place the buns in the hot oven and bake for 20 minutes. Serve hot stuffed buns with tea or let them cool down on a wire rack. Can use only plain flour instead of wholewheat flour. If you use only plain flour, use only 2¼ tsp yeast. For kneading technique check out the recipe for rosemary sunflower seed bread. If you do not have instant yeast, then you will need to ferment the yeast before adding it to the flour. Take about ½ cup of warm from the measured quantity. Add sugar to it and mix. Sprinkle the yeast over it and cover. After 10 minutes, the mixture should be bubbly and frothy.